That sun-kissed look – it really is the perfect summertime accessory, isn’t it? While we love the warm glow of the sun during the summer, we’re all aware of its extreme dangers. Sun exposure puts us at a higher risk of cellular damage, early wrinkling, age spots, actinic keratosis and skin cancer – including one of the most deadly – melanoma. With risks like these, it’s important to shun the sun. However, that doesn’t mean you have to say goodbye to your summer glow. Thanks to increased attention in the media about the short – and long-term effects of sun exposure, most people today are aware that sunless tanning is the way to go. At Dawn Career Institute’s New Beginnings Spa, we’ve seen an increase in clients asking for sunless tanning options. Throughout the years, the sunless tanning industry has improved. The days of that orangey glow are long gone! New Beginnings Spa and spas across the country now offer a wide variety of realistic-looking and easy-to-apply options. Today, there are an abundance of sunless tanning options, from hand-applied lotions to spray-on tans. If you’re looking for a treatment from a bottle, we recommend the original St. Tropez hand-applied treatment for a bronzed, long-lasting glow. Many of our clients like this option because it can be applied in the privacy of their own home. We also love Bronze Biologic Spray Tan for a premier cosmeceutical tan. Their self tanner doesn’t contain any toxic chemicals, dyes, perfumes, alcohol, or artificial colors. 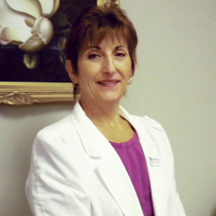 This all-natural treatment delivers great results that our clients love. Interested in a gradual glow? Try Jane Iredale Tantasia. This self tanner auto bronzant is a moisturizing bronzant for the face and body. It gradually gives you a healthy look in three days for optimum control and customization. So Bronze line by Jane Iredale in the shades of Moonglow, Sunbeam, and Rose Dawn. Wear dark, loose-fitting clothing and flip flops or sandals to allow your skin plenty of “breathing room” to dry properly. You wouldn’t want most of the tanner going on your clothes! Risks of sunless tanners are extremely insignificant compared to the dangers of tanning naturally. However, it is important to know that sunless tanners contain the chemical DHA. The chemical is approved by the FDA for topical use because it doesn’t absorb into the skin deeper than the outer-most layer of dead skin cells. However, DHA is dangerous if ingested or if it makes contact with your eyes. Also, it is always advised to make sure you are not allergic to any ingredients in a sunless tanner. Summer can be tough on skin, from chlorine in swimming pools to the blazing sun. Besides applying sunless tanner, there are many ways you can ensure your skin is glowing this summer. Beauty often starts from the inside – what you put in your body, not on it! We encourage our clients to stay hydrated throughout summer. Beyond the obvious health benefits, it keeps your skin looking beautiful. Skin needs to stay moisturized, and it starts with drinking enough water. Stock up on a body scrub, and use it several times a week. Use it on elbows and heels that can get especially dry from the sun during the summer. A great moisturizer is also a must. Always apply it right after your shower. We love Dermalogica Ultra Rich Cream or A Natural Difference cranberry or mango body lotions –they smell delicious! Most importantly, use sunscreen and remember to reapply. You really can’t use enough. We recommend Dermalogica, A Natural Difference and Jane Iredale sunscreens at our spa. Don’t forget about your lips – they can burn, too! The summer sun is calling! With the right skincare routine and a great sunless tanner, you can achieve the perfect summer tan without the risk of skin cancer and sun damage. So tell Mother Nature, thanks, but no thanks! 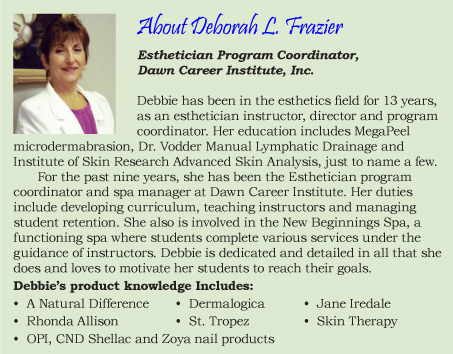 Dawn Career Institute can prepare you for a career in the beauty and wellness industry! Students in DCI’s Esthetician program can learn how to perform facials, waxing treatments, microdermabrasion, makeup application and many more skin care procedures. 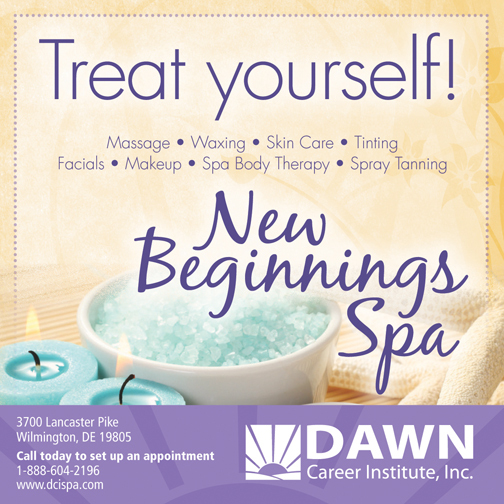 The New Beginnings Spa at Dawn Career Institute also offers students an excellent opportunity to gain professional experience working with real clients. ← Previous Story Get The Fresh Face You Want For Spring With Mineral Makeup!